Many people are looking for a safe and effective solution to help them support and maintain healthy blood pressure levels. One of the most important nutrients for people who want to support healthy blood pressure is magnesium. Magnesium allows the smooth muscle cells that line the blood vessels in the body to relax. The chemical forms of magnesium normally available in health food shops and drug stores (magnesium oxide, magnesium chloride, magnesium gluconate, magnesium lactate, magnesium aspartate, magnesium hydroxide, magnesium sulfate and magnesium citrate) do not interact with the body in the same fashion as magnesium amino acid chelate. Those forms when used in sufficient quantity, most often cause the bowels to loosen and you end up with severe diarrhea. This should not occur with the RHP® Blood Pressure Support Formula. In fact, magnesium must be combined with other minerals to be most effective in helping support healthy blood pressure levels. "Calcium, magnesium, potassium, and a reduced amount of sodium work together to optimize blood pressure. And each has an effect on the actions of the others. "For example, low magnesium will cause low potassium, so until the missing magnesium is replaced, taking potassium alone will not increase blood potassium levels. "And if you want to reduce blood pressure, taking more calcium, potassium, and magnesium together, combined with a low sodium intake, will be more effective than doing any of these things by itself." by Mark Houston, M.D, and Barry Fox, Ph.D. Evidence indicates that potassium supports health blood pressure levels and has many other health benefits, therefore, we included potassium in the RHP® Blood Pressure Support Formula. But there is a reason! "Odd as this may seem at first glance, adequate levels of calcium in the body keeps excess calcium from entering the cells. Low levels of calcium in the body cause a buildup inside the cells. "The pressure exerted by proper levels of calcium in the body on cellular walls keeps those cell walls healthy. This prevents calcium from leaking into the cell that would result in excess calcium within the cell. "This results in less tension in the cells lining the blood vessels and healthy blood pressure." Vitamin D3 (often referred to as Vitamin D) is an important nutrient and your body requires it to absorb calcium. Vitamin D3 is actually manufactured by the body if we get enough sunshine. Exercise and calcium from our diet are also required to manufacture vitamin D3. Most of us do not get enough exercise and fail to eat calcium rich foods like vegetables and/or dairy products, or oily fish. Without enough vitamin D, one can’t form enough of the hormone calcitriol (known as the “active vitamin D”). This in turn leads to insufficient calcium absorption from the diet. Vitamins B1, B2 and B6 have been shown to support healthy blood pressure levels and glucose metabolism. 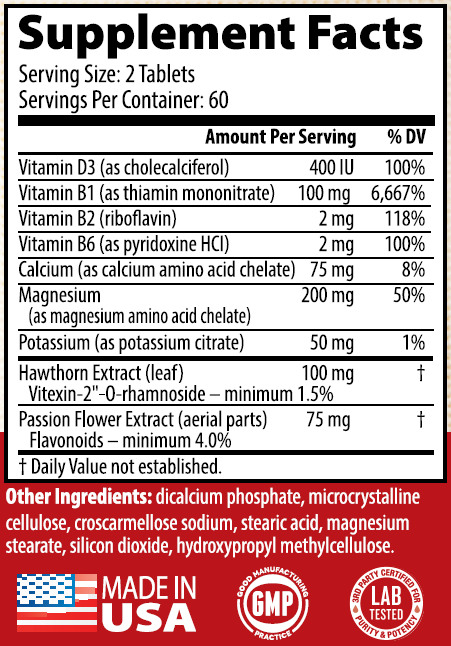 Also included, are two vital botanical extracts that have been shown to help support healthy blood pressure levels. Hawthorn has been used for hundreds of years by herbal practitioners. More recently it has been used as a safe and effective way to help strengthen and normalize the entire cardio-vascular system. Passion flower has been historically used as a safe and effective herb to help reduce sleeplessness, nervous tension, and irritability. Passion Flower Extract contains active ingredients that help to relieve anxiety, relax and calm the individual. This acts to reduce day-to-day stress. 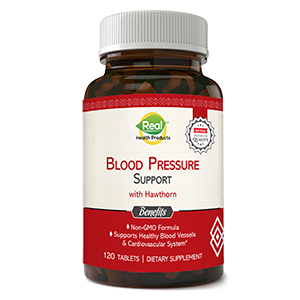 RHP® Blood Pressure Support Formula contains vitamins and minerals which are in a form that are highly bioavailable. These vitamins and minerals are much better absorbed, utilized and retained by the body. The RHP® Blood Pressure Support Formula is a dietary supplement specifically formulated for the support of healthy blood pressure and a healthy cardiovascular system. 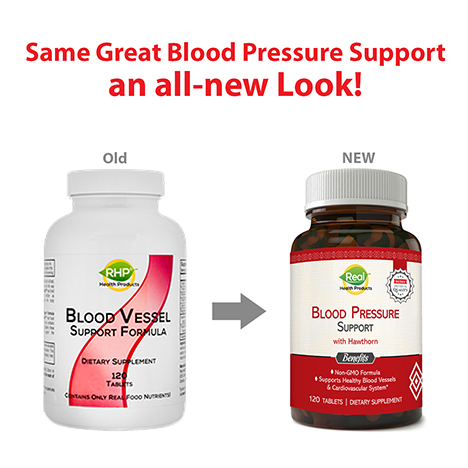 We're so sure about the quality and effectiveness of the RHP® Blood Pressure Support Formula, and that you will experience the results you want, we offer a 90-day money-back guarantee. A bottle containing 120 tablets is now on sale for $36.20 (a $13.50 dollar savings!) from the original price of $49.70. Order the RHP® Blood Pressure Support Formula and experience the results for yourself! Order the RHP® Blood Pressure Support Formula Now!